Many congratulated her on the save delivery of her first son but Mavin Records first lady, Tiwa Savage has shared her scary experiences during the last stages of her pregnancy. 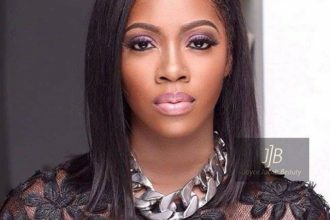 Tiwa Savage has explained that pregnancy and childbirth is not easy she revealed that it was difficult bringing forth her son. The singer who covers the latest issue of Genevieve magazine revealed she had pre-eclampsia and had her baby boy’s birth was induced because his birth was delayed in coming by 8 days . It took Tiwa and her husband, Tee Billz several months to reveal the name of their son. They took to Twitter to announce his name as Ivory last week, the couple are yet to reveal the face of their son four months after his birth.